Esplora la città di Bogotá in questo tour turistico guidato di alcune delle più famose attrazioni della città! Cammina per le strade lastricate di Candelaria, il quartiere storico di Bogotá e ammira La Catedral Primera (Prima cattedrale). Scegli il tour di 5 ore per includere una visita al Museo de Oro (Museo dell'oro) e un giro in cabinovia sul monte Monserrate oppure scegli il tour di 8 ore per includere anche il pranzo e le visite a più siti di interesse, come il quartiere di Usaquén. Una bendición tener un guía como Alejandro. Un gran Manejo de la información y de la historia de la ciudad. Que nos regalo una vista de la ciudad increíble hasta para aquellos que ya la conocíamos. Un joven Dotado de grandes virtudes. Fue maravilloso conocerlo y nuestra visita guiada con el solo Podríamos defininirla como excelente. We booked this tour for the day of our arrival in Bogota. Unfortunately, this was a Sunday - a very busy day anywhere in the city! The delightful guide was on time to collect us at the hotel. However, the queues to take the vernacular up to Montserrat (and then down) were so long that the rest of the tour to the Gold and Botero museum wasnot possible. Similarly, we were only able to glimpse the old centre of Bogota in the dark. Perhaps this tour was too ambitious on a Sunday afternoon? This is an excellent tour with perfect timing. The tour guide was excellent, very professional . I strongly recommend it. Alejandro gave a highly personalized tour through Bogota while adding insightful details on the historical and cultural significance of all that I was seeing. All around great guy and awesome experience! 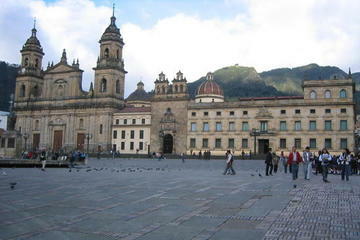 We enjoyed this tour and felt that it gave a good overview of Bogota. We started the day riding the cable car since the weather was nice in the morning. We did have a little problem finding our guide in the crowded hotel lobby as he didn't have a name tag or company jacket on. The guide spoke English well, was kind, and took photos of us. I thought the gardens on Mt. Montserrat were beautiful and there are gift shops as well. The other highlight of the tour was the Boltero Museum. It contains paintings of other artists as well and has an interesting lay-out. The Museo de Oro was closed because we were there on a Monday. Instead we went to a wonderful coffee shop. My guide, Alejandro from Via Colombia Travel Services, was extremely knowledgeable and very relaxed. It was an easy going tour even though we covered a lot of information and sites. I really appreciated this thorough introduction to the capital, especially the vist to the the Gold Museum. Thank you Alejandro! Was a great trip. Our tour guide Chris did a good job ensuring all participant where back on mini bus promptly avoiding frustrations that I have seen in the past when people are always late back. There was about 12 in the group. We did an early visit to Christ the redeemer before the cloud came in entrance not included we then went to sugar loaf mountain entrance/ cable car cost not included we toured around had lunch in a buffet style restaurant not included visited a monastery and were returned to our pick up hotels. Was a good tour but I would prefer all the extras were included in the cost I know they do do a tour that includes the extras but it was full when I tried to book. If I did it again I would book early and book the one with extras included. Great views from the vantage points we visited. very good tour, good guide, definitely worth the money. Cable car ride was fun, beautiful scenery. I booked this trip the morning of. The group IMPULSE worked very hard to arrange a driver and a guide. I accidentally got in the wrong car leaving my hotel yes... I know... duhhh and the company worked with the driver to get me to the drop off point to meet my guide. The rest of the tour was amazing. I saw EVERYTHING on my list in only 5 hours and I did not feel rushed at all.